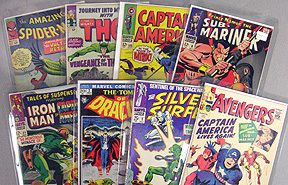 (Silver age comics are from the 1960’s and typically have a 12 cent cover price) especially Superheroes 1961-1970. 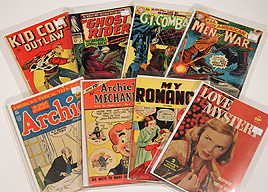 Amazing Adventures, Amazing Spider-Man, Avengers, Captain America, Daredevil, Defenders, Fantastic Four, Hulk, Iron Man, Journey into Mystery, Marvel Premiere, Marvel Tale, Mavel Team-up, Sgt, Fury, Strange Tales, Sub-Mariner,Tales of Suspense, Tales to Astonish, Thor, Tomb of Dracula, Werewolf by Night, X-Men and more. 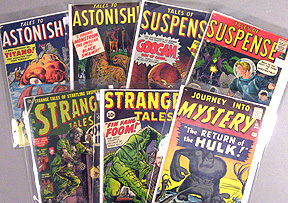 Amazing Adventures, Amazing Fantasy, Journey into Mystery, Strange Tales, Strange Worlds, Tales of Suspense, Tales of Suspense, Tales to Astonish, World of Fantasy and more. Action, Adventure, All Star, All American Men of War, Atom, Batman, Brave and Bold, Captain Action, Challengers of the Unknown, DC Special, Detective Comics, Eighty Page Giant, Flash, GI Combat, Green Lantern, Hawkman, House of Mystery, House of Secrets, Jimmy Olsen, Justice League, Lois Lane, My Greatest Adventure, New Gods, Our Army at War, Our Fighting Forces, Sensation, Showcase, Star Spangled War, Strange Adventures, Superboy, Superman, Tales of the Unexpected, Teen Titans, Unexpected, Weird War Tales, Weird Wetern Tales, Wonder Woman, World’s Finest and more. Archies, MLJ, Timely’s. DC’s, Nedor, Fawcett, Fox, Centaur, Quality, Fiction House, Harvey, Prize, Ace, Better or others. 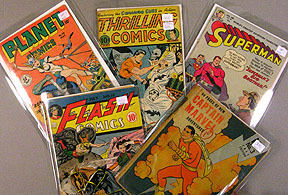 Some titles include: Ace, Adventure,Beyond,All-Winners Captain America, Batman, Captain Marvel, All Flash, Crack, Blackhawk, Catman, Fight,Jumbo, Jungle, Modern, More Fun, Planet, Superman, Thrilling and more. Call us anytime for help identifying titles and ages. Avon, St. John, Gilmour, Ajax, Farrell, Atlas, Harvey, Prize, Ace, and others. 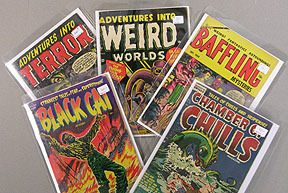 Adventures into Terror, Adventures into Weird Worlds, Baffling, Black Cat, Chamber of Chills and more. Bronze Age Marvels and DC’s especially Key issues and high grades Superheroes and horror. Titles include X-men, Hulk, Iron Fist, Defenders, Batman, Daredevil, Spider-man and many more. some other genres can be quite valuable depending on the vintage and the artist. We buy ALL Original art! We are happy to travel to your location to look at your collection. Initially, please take a moment to contact us and provide us with a list of at least some of the books and a few digital photos or scans. Also, we can meet on Skype to discuss your comic book collection. We pay excellent prices. Cash available immediately for your comic book collection. 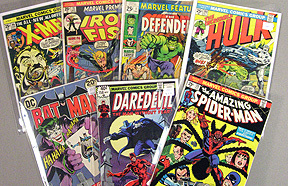 Top Prices Paid for Your Comic Book Collections! 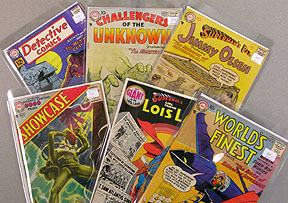 We can give you expert advice on grading your comic collection as well. 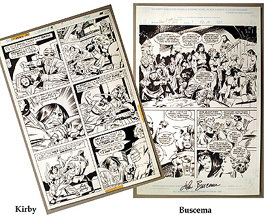 We also buy ALL Comic Book Original Art!